Low back pain originating due to lumbar spinal stenosis can be a congenital origin, an acquired condition, or are a combination of both. The most common cause is degenerative changes is due to aging of the spine. A combination of disc degeneration, bulging disc and facet and ligamentum flavum hypertrophy, in the posterior column, bone spurs cause concentric narrowing leading to central spinal stenosis. A combination of a bulging disc, and or a laterally protruding disc and facet degenerative changes can also cause neuroforaminal stenosis. The degree of spinal stenosis is rated as mild, moderate, or severe in the central canal or the neural foramen. Lumbar spinal stenosis due to degenerative changes is the most common cause of spine surgery in the elderly population over the age of 65. Symptoms may include low back pain, pain radiating into the lower extremities, more better weakness and or numbness or tingling sensation, neurogenic claudication (pain, discomfort, numbness and tingling, or weakness in the muscles of the lower extremity success exacerbated by walking, and relieved by a flexed posture or rest.). The presentation of pain that is placed on the overriding factor is central canal stenosis or neural foraminal stenosis. Significant neuroforaminal stenosis can cause radicular pain in a specific dermatomal distribution, or pain radiating into the lower extremities presenting like sciatica pain. 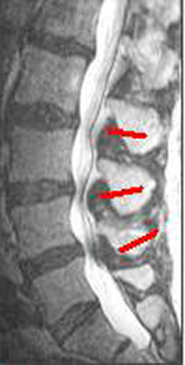 A lumbar spine MRI is a good diagnostic study. It can detail the degenerative changes causing varying degrees of central and neural foraminal stenosis. This can be correlated with the presenting history and physical examination. Conservative treatment is the first recommended treatment option for most cases of pain due to lumbar spinal stenosis. -The goal is to avoid aggravation of pain e.g. pain due to neurogenic claudication. – Avoid activities long walks, running, standing for prolonged periods. In order to be treated for your Lumbar Spinal Stenosis, please email or call Innovative Pain Solutions today at 407-284-1993.